A still from a scene I was responsible for visualising. Many ideas made it to the final animation. 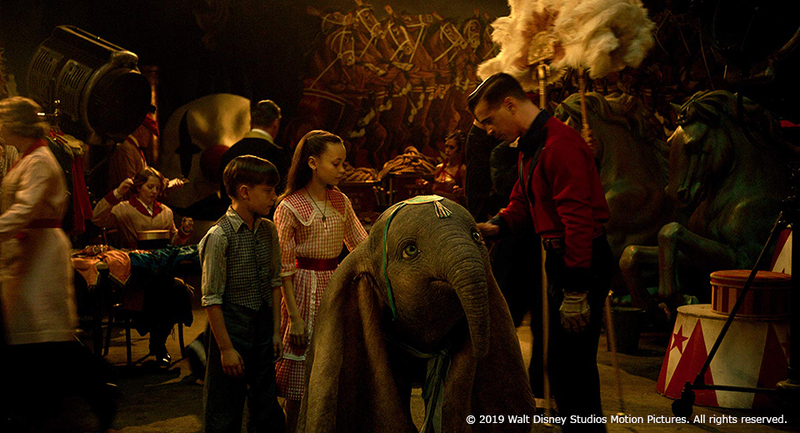 Disney’s Dumbo from 1941 was a beloved Classic and picking Tim Burton as a director was certainly an interesting choice for the series of Disney’s Live Action remakes. It was also one of my favourite movies from my childhood. Since the original plot only covered 61 minutes and contained lots of filler animation, Tim Burton decided to go a different direction, taking out talking animals (Dumbo and Mrs. Jumbo weren’t big talkers anyways), covering the original plot in the first act and continuing from there, making it part sequel. The Third Floor started in visualizing key scenes like the flying scenes in both the circus and Dreamland, but later on visualized the whole film due to their impressive work. I joined the film at the Postvis step, meaning most of the time Live Action Footage already existed and we added Elephants, animals or digital props so the filmmakers could figure out if scenes work in the cut while the cast was still filming them. The final animation was handed by MPC and other vendors, but since VFX supervisor Richard Stammers and production asked for a high degree in quality from Pre- and Postvis, lots of the shots we did were very close to the final product. The team of The Third Floor Inc. was also an overall lovely bunch, and I cherish the memories I made in London! The film premiered on March 29th 2019 worldwide. All product names, logos, images and brands are property of their respective owners, in this case Paramount Pictures. All company, product and service names and images used in this website are for identification purposes only. Use of these names, logos, images and brands does not imply endorsement.